Hill is the latest in a recent wave of talented young runners — all female — to join the professional ranks while still in high school, going straight to salaried racing and leapfrogging the traditional step of collegiate competition. This is a path that not even Olympic gold medalists like Carl Lewis, Jackie Joyner-Kersee or Edwin Moses took. Allyson Felix turned professional instead of running for the University of Southern California in 2003, going on to become one of the most successful American sprinters in history. Felix remained the only track athlete to bypass college for professional running until a decade later, when the middle-distance runner Mary Cain signed with Nike in 2013 at age 17 before enrolling at the University of Portland. She opened the floodgates. Cain was followed by the distance runner Alexa Efraimson, who signed with Nike at age 17 in 2014. Earlier this year, Kaylin Whitney, who set the high school 100-meter record before Hill shattered it, signed with Nike on her 17th birthday. The middle-distance runner Ajee’ Wilson turned pro right after high school instead of competing in college in 2012. Hill has started working with a new coach, Tony Carpenter, who has arranged for her to train with top regional athletes of all ages. 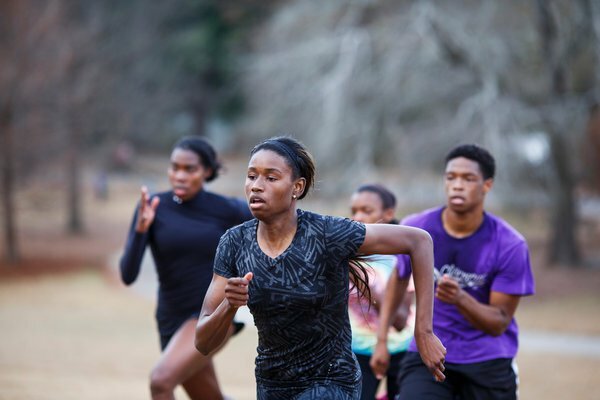 Hill’s ascendance from the youth sprinting scene in Georgia to the national and now international arena has taken place over a matter of months, as she emerged from an ordinary high school track team with little specialized training. She lost her first race in high school, to an upperclassman, and won every one since. Now, instead of running high school races she will enter the international professional racing circuit, competing for financial prizes against the world’s fastest runners. She is still very much a high school junior, switching easily between talking about her wanting to win every race she runs to taking trackside selfies with Usain Bolt, discussing her gown for when she was voted to the homecoming court this year and lamenting the missing A in her report card. (“Chemistry. …”) For breakfast on race days, she eats Froot Loops. 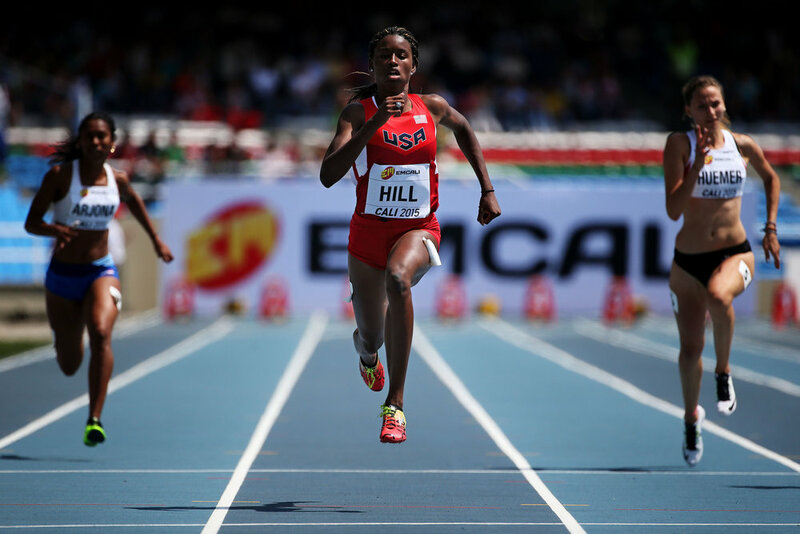 Hill competed in the 100 meters at the world youth championships in July in Cali, Colombia. The looming Olympic trials, to be held next July in Eugene, Ore., have expedited the timeline for turning professional because of the training and financial benefits such status confers. Hill is the youngest track athlete to qualify for the United States trials in both the 100 and 200 meters, and has logged the eighth-fastest time by an American woman in the 100 this year. Regardless of an athlete’s talent, turning professional as a high school runner remains relatively rare, especially because it means forgoing a college track scholarship. Before the deal with Asics, Hill considered U.S.C. or Florida for their strong sprinting programs. She hopes to study biology and later enter sports medicine or become a sports journalist. Given the limited number of full scholarships available in track and field, it can be difficult to match an ideal college program to a coach. 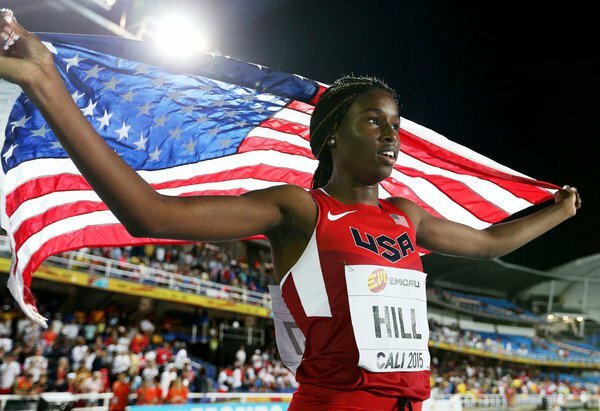 Hill celebrated after winning the girls’ 100 meters at the world youth championships in 11.08 seconds. She also won the 200. But now she is a part of the trend of teenagers turning pro. The other runners who have made the jump in recent years have had mixed results, with some struggling to maintain their competitive edge after turning professional, an issue sometimes attributed to the additional stress of higher training loads on younger bodies. Asics and her development team have said they are committed to letting Hill develop at her own pace — ensured by a contract that lasts through her peak athletic years, until she is 26. That also means, according to her contract, that she will still go to prom — and probably also continue to work on homework between racing heats at track meets. Her father, Gary Hill, recalls driving furiously from a meet to a coffee shop so she could use the Wi-Fi to submit an assignment for a class on time. As Hill’s parents continue to drive her to school and practice each day, Asics will also arrange for her father, who is a technician for United Airlines, and her mother, Lori Hill, a mental health clinician, to accompany her to all of her meets, along with her younger sister, Rachel. Hill often trains at Piedmont Park in Atlanta. One thing that has changed is Hill’s training: She began working with a new coach 10 weeks ago, moving to Tony Carpenter after her record-setting sprint in June. (Asics says it will not influence her coaching choices but will help support them.) Carpenter will collaborate with her high school coach and others. Carpenter has coached track athletes for the past 20 years, including world youth champions and professional sprinters like the Jamaican Olympic medalist Veronica Campbell-Brown. Now that Hill has no high school team, Carpenter has curated a group of top regional athletes of all ages for Hill to train with. Carpenter said that when he first saw Hill race, when she was 13, he was struck by her natural talent and competitive nature. Hill says she is focusing on building her speed while managing her new fast track, in both school and sports.